"We can't thank you enough for the great selling experience you provided for us. From our first meeting walking through the property to the final phone call at closing, we have found you to be warm, friendly and a true expert in the field. We noticed all the little things you did to make this process easier for us. We knew you were going above and beyond, and making this a stress free process for us. We felt confident that we had the right person representing us. Thank you for everything. We couldn't be happier with the outcome and we feel like we gained a friend in the process. 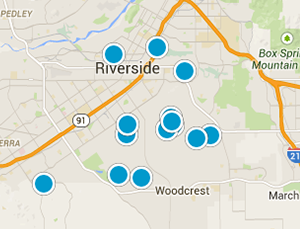 We will be sure to recommend you to our friends in family looking for a realtor in the Riverside area. You are awesome!!" "I can't be any happier with your professionalism and fast response to all of my questions. Everything went very smoothly and I'm glad that we found you to assist us throughout this stressful journey. I'm definitely giving you my highest ratings without any hesitation. Thanks again for all your help." "Don and Vicki, Another house sold and another move tackled. I could not have done this without your expert assistance and willingness to go the extra mile as only family or friends would do. Thank you, thank you, thank you! "Nicole and I want to thank you for selecting the perfect house for us. This is our first home and is perfect for our family. It only took Vicki 3 weeks to find us our house. We lived over 100 miles away, so every time we came out to look at houses Vicki had at least 5 to 7 homes that fit our criteria. By the third time we came out to look at homes, we found the house we live in today. Vicki was so polite and professional it made the process so easy to buy our house. We went through 3 realtors before we came to Vicki Pedersen. Having the right realtor makes all the difference in the world. 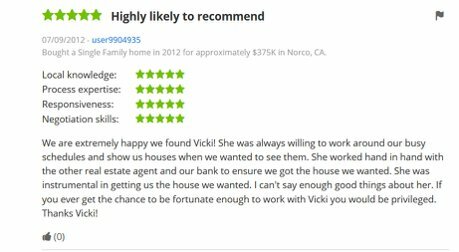 I recommend Vicki to anyone who is looking to buy a house, because she is someone you can trust." "Susan did a great job helping me pick the exact home I was looking for. She was very knowledgeable about the area I was interested in and was extremely flexible in arranging times to view houses with my unusual work schedule. It took almost no time at all for Susan to find the home we ended up buying and she made sure we got the best deal possible with the sellers. We couldn't be happier with the purchase or with Susan's hard work." "When I wanted to buy my first home, Susan really took the time to understand what I wanted in a house so that she was able to weed through the many houses on the market and show me houses that truly fit my criteria. She is so knowledgeable about the whole area, she knew exactly where to lead me, and she was never, ever pushy. She was always available for my numerous questions, and she worked around my busy schedule. When it came time to make the purchase, she explained all of the complicated paperwork to me and really guided me through the whole complex process. She is experienced and very hard-working, but she is also very patient and kind. I highly recommend Susan Davis to anyone who wants an agent who actually cares about them as a person, not just a "sale". "Being a first time home buyer is a daunting task to say the least. There are questions, unknowns, ups, and downs. With Vicki on our side, buying our first home was an enjoyable, once in a lifetime experience. Vicki was always there to offer her advice, and words of comfort and encouragement. She was reassuring and supportive, and truly made us feel like we were her most important client. The home buying experience was fun and exciting, and we could not be happier with the result. Because of her hard work, late nights, and often weekends, we now own the home of our dreams! We recommend her to anyone and everyone we know. Whether it be your first home or your last, you can't go wrong with Pedersen Real Estate!" "I would like to thank Pedersen Real Estate for your very professional handling of all the details pertaining to the purchase of our new home. Though there were many individiuals involved in representing many agencies, you were the one that aligned all of the straying loose ends. I feel that we were extremely fortunate that you were our agent. It is obvious that you truly "love what you do" as you reassured me several times. You were so courteous and patient with us and though I tried my best to do resarch and educate myself about some of the processes and procedures involved, I knew that we needed your help so much. Your straightforward, ethical guidance will always be remembered. Thank you for helping us understand what to expect." "Susan provides expertise in a friendly and helpful manner. She is ready to answer questions and provide guidance. Her experience really came through on a recent sale with a new buyer. I highly recommend Susan. I live over 2 hours away from Riverside. During a house purchase, she mitigated the distance between us and created a smooth purchase experience. After working with other agents, Susan was recommended and we quickly found a nice house. She produces results. We had an easy close in escrow thanks to Susan. She was extremely knowledgeable and helpful with recommending local contractors and repair men to resolve issues as they came up. She is easy to contact and an effective communicator." "I can't say enough good things about Vicki! She was more than helpful and even after our home was bought she helped us with a minor problem! She didn't walk away and let us fix it on our own. She didn't just show us the houses, she gave important information like property tax which first time buyers don't always think about. She responded by email everyday and basically held our hands through the process. No question was a dumb question! As a first time home buyer we had many questions and she answered them all or found the answer! Best of all she informed us of information that we wouldn't know to ask. I would recommend her to any and everyone! When or if we decide to look again, we will contact Vicki!" "I can't thank you enough for enough for sticking with me through the "long" process of finding my first & perfect home. I appreciate you helping me as much and as long as you did. You went way above & beyond for me, especially during my time at work. You are very professioinal and knowledgeable in what you do. Saying you are the greatest realtor would be a huge understatement. I am glad to have met you as a realtor and as a friend. I just want to say thank you from the bottom of my heart. You have made a wish come true." "Don and Vicki Pedersen are outstanding real estate agents/people. Our experience couldn't have been more professional. They were always right on top of every task, leaving nothing uncovered. We are also very thankful for the opportunity to work with them. They come highly recommended. You guys are all-around great people. Thank you very much. We love the new home and are thrilled with Riverside." "Negotiating short sales is a very daunting task but having a professional and honest realtor like you Vicki, help made the closing all possible! From the very first phone call, I knew that you had your client’s interest at heart. The way you explained your client’s offer showed that you had a deep concern for their interest and not your own. I must say that my clients and I are very lucky to have you on the other end of that short sale because it was your direct communication and team work that lead to a successful closing. I applaud you and wish every client out there would be so lucky to have you on their side. Thank you Vicki, I couldn’t have done this without you!" "Our family is so very grateful for the hard work Vicki put into us and helping us find a home to fit our needs. Without you we would not be where we are today. Thank you does not seem to be enough for how we all feel. With a million thanks to you always." "Thank you so very much for all of your help and your tremendous patience in helping to sell my mother's house. You stood strong and wise for many months.... I'm sure you were not paid your worth." "It took quite a long time to find the home we wanted at a price we could afford. Don and Vicki were persistent in searching and patient with us to a successful conclusion! Thank you Pedersen Team! "We had originally used a different realtor and were very dissatisfied so we went with the Pedersen Team and the difference was like night and day. They were great from day one with great exposure via the web and letting me know step by step what was going on. We sold our home quickly and efficiently and were kept up to date constantly. We found our new dream home and hope to stay here forever, but if the need did arise to sell, we would use the Pedersen Team again without hesitation. They are highly qualified and very courteous. We would recommend them highly to anyone thinking about buying or selling their home." "Working with Pedersen Real Estate was easy and professional. Your service was not only patient but above and beyond the expectations I had of a real estate agent. Your constant attention to my needs and preferences of the home I wanted helped me to find the perfect place. I appreciate your dedication and would highly recommend you to all of my friends and family; which I have already done. Thank you." "Joyce and I are very happy with the house you found for us through daily listings on the computer. We were totally unfamiliar with California real estate and we were in a hurry. We could have gotten into a real mess by ourselves. Thank you for your guidance throughout the process and for your promptness in responses/questions. You get the job done!" "My husband and I are very satisfied with the work that Vicki has done as our real estate agent. 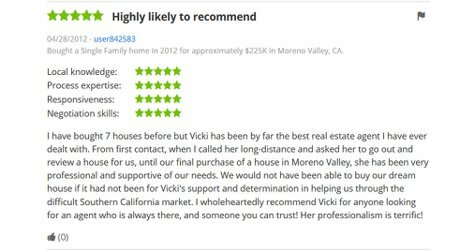 Vicki was always informative and never pushing or pressuring us to buy a home. She always answered and responded to our needs as soon as possible. Though I am sure Vicki was busy with other clients, she made my husband and I feel important and we felt like she always put us first. Vicki is great at doing counter offers, which helped us to be more confident in getting the home that we really wanted. I will recommend Vicki and Don to family and friends who will be looking for a home. Thanks, Vicki, for all your patience and hard work." "Having the Pedersen Team sell our home was a very positive experience. We found them to be completely professional, while friendly and personable. They demonstrated thorough knowledge of the area in which we lived and gave us candid, sound advice regarding the current market, pricing for our home, and staging strategies. They were conscientious, kept us informed, and worked tirelessly to sell our home. Without the Pedersen Team it might still be on the market. We are truly grateful for all their hard work and expertise." "The motto of "Above and beyond" is truly the reflection of the Pedersen Team. This goes from the personable to professionalism of handling the business of selling our home in Riverside. I had interviewed 7 agents, all from reputable and large companies. I had many questions especially in a time where selling our house was unfavorable, but our move to Northern CA outweighs a depressed housing market. Vicki Pedersen did her homework - knowledge of my area, first-class brochures and flyers, outstanding web-site showing, plus many more behind the scenes including weekly activity report which I received "heads up" info. I had worked with many agents in the past (had owned 5 homes), Vicki Pedersen just tops them all. Anyone who is planning to sell their home will not be disappointed with the Pedersen Team - integrity, professionalism, knowledgeable - from start to finish." “When we decided to sell our home during a really tough real estate market, we knew we were facing significant challenges and were going to need the best sales team available to help us accomplish our goals. We chose Don and Vicki Pedersen because we were impressed with their knowledge in the general real estate market and, more particularly, with our immediate market. We also felt it would be a great advantage that they worked as a team, which would increase their availability to be directly involved in all important and key aspects of the sales process. Within a very short period of time, we knew we had made the right decision. From staging, to marketing, to weekly market updates, to personally attending showings to prospective buyers, they did everything they said they would do and more. And - our house sold! We are so grateful for Don and Vicki's expert assistance and would recommend them to anyone." Housing Market Forecast for 2019??? Buying a Home? What about HOAs and How Do They Work? We take your privacy seriously and do not share your information with anyone outside of Pedersen Real Estate.